Professor Kris Schmidt usually sticks to his syllabus, but this week, with the clock winding down before final exams, he was forced — by his appreciative students — to take a break. 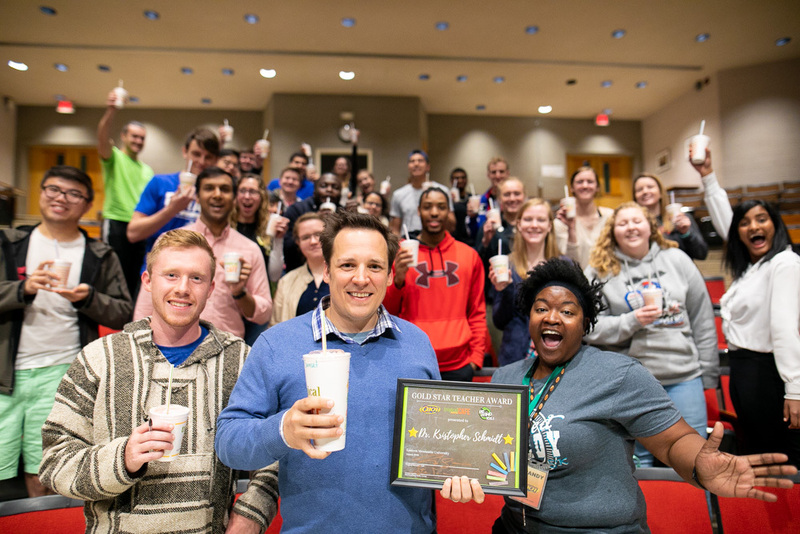 Between lectures on the glucose transports systems and adrenocorticotropic and pancreatic hormones, Schmidt’s human physiology class at Eastern Mennonite University sipped smoothies from Tropical Smoothie Café in celebration of his Gold Star Teacher Award, an award come to fruition (no pun intended) by the publicity efforts of graduate student Alethea Gnanakan. She heard about the contest on the radio. Each month, Q101 selects two teachers for recognition from student nominations. Gnanakan secretly rallied her classmates via email to send in nominations. Every single one did. From left: Brandy from Q101, Professor Kris Schmidt and graduate student Alethea Gnanakan, who led the nomination efforts among her classmates. Schmidt arrived at EMU in fall 2017 from Goshen College. He teaches biology courses to undergraduate and graduate students and directs the undergraduate pre-professional health science program. His wife, Kathryn, and son Zachary, 5, came to class to join the celebration. Gnanakan, who aspires to go to medical school, says Schmidt’s support — she describes him as “super-invested” — during her preparations has been invaluable. “He nurtures us as a class in dialogue, empowers us to cultivate an inquisitive mind, and then also to pay it forward by teaching others,” she said. Another student shared appreciation for his “enthusiasm and energy” in the classroom, but also “the tremendous amount of time and effort into helping students connect with opportunities outside of class with research projects and travel experiences. 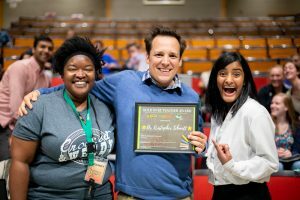 “He’s gone out of his way to help his students find success inside and outside of the classroom,” she said. After selfies were taken with Q101 radio personality Brandy and he was presented with a $30 gift certificate to the Green Valley Book Fair, Schmidt looked at the clock, clearly calculating the material left to cover before class was over. What a wonderful recognition. Glad to see Kris recognized by his students in this way! Kris- you rock! you did at GC and the legacy continues! Happy to see Dr. Schmidt receive such an honorable award! You’re a great addition to EMU and the biomedicine program!